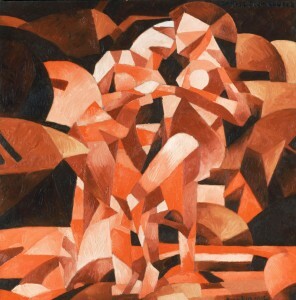 Picabia derived the subject of this painting—two dancing girls in a landscape—from a peasant dance he saw in the Italian countryside during his honeymoon in 1909. The canvas belongs to a group of large-scale works Picabia painted from June to September 1912 that demonstrate his unique approach to Cubism. The fragmented planes, shallow space, and allover pattern of lights and darks reflect the analytic Cubist style pioneered by Georges Braque and Pablo Picasso, while the semi-abstract evocation of bodies in motion suggests works by Italian Futurist painters who were beginning to exhibit in Paris in 1912. When Picabia’s work appeared in the Armory Show, it received a huge amount of attention in the press. While many acknowledged his important role in creating and promoting avant-garde art, others had a difficult time understanding his work. In his satirical article entitled “Why I Became a Cubist” that appeared in Everybody’s Magazine, Julian Street wrote that Dances at the Spring “looked to me like a crazy-quilt made up of rectangles and triangles of red, rose, and white” that he found inscrutable, even after others attempted to explain it for him. Dances at the Source was reproduced and sold in postcard form at the Armory Show. The canvas was offered for sale for $675 and was purchased by the Chicago collector Arthur Jerome Eddy for $400. Julian Street, “Why I Became a Cubist,” Everybody’s Magazine 28:6 (June 1913), 818.